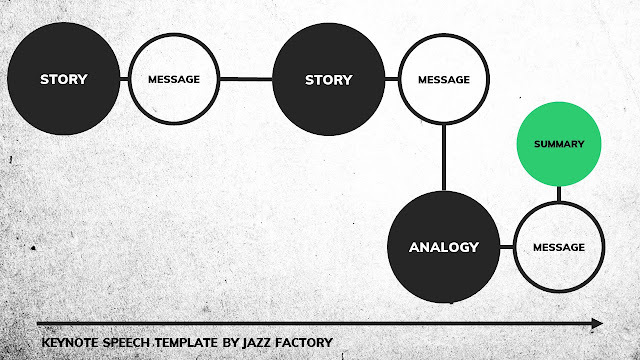 'All About Presentations' by Jazz Factory: How to structure your Keynote speech to wow your audience? How to structure your Keynote speech to wow your audience? You have to deliver a keynote speech at an event. 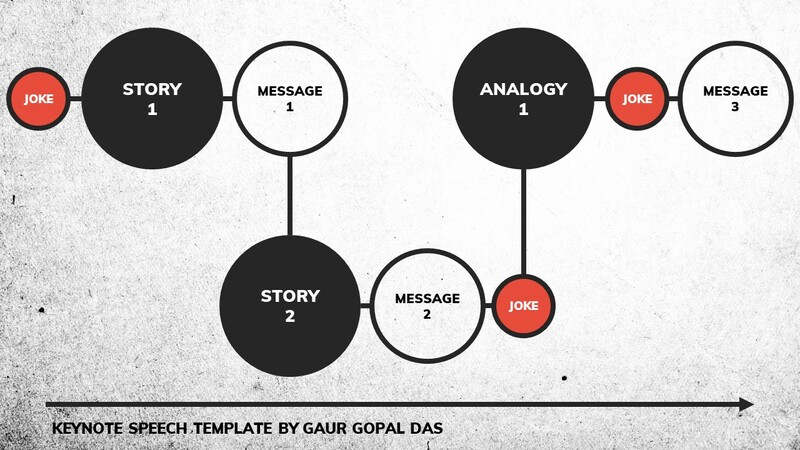 Here is a simple template you can use to structure your keynote speech. Remember that your story contains your message. What we are doing is to narrate the story first and then share the message. Your analogy works the same way. Mention the analogy and then your message. Gaur Gopal Das is a prolific speaker and a life coach in India. I have developed this keynote speech structure inspired by his 18-minute talk where he has used this template very effectively. 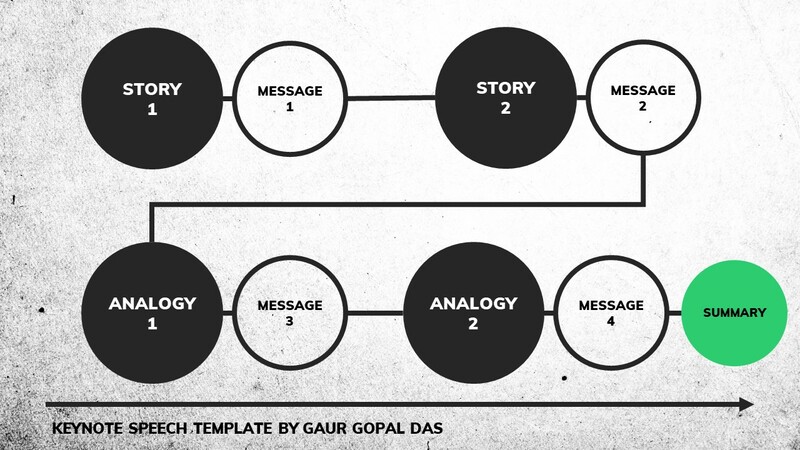 This is the structure Gaur Gopal Das has followed in his keynote speech. 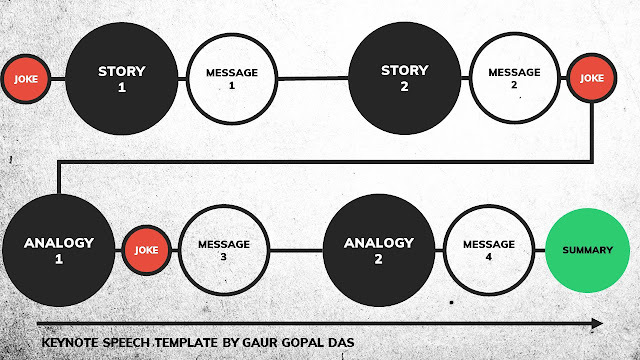 Gaur Gopal Das has 2 stories and 2 analogies. But being a prolific speaker he knows the importance of humour. What he has done is planted various jokes in the presentation. This is how his keynote speech structure finally looks. At the end he summarises and repeats all the four main messages. You will note that he uses Hindi words frequently. His first joke is in Hindi and is a famous dialogue from Bollywood. If you know your audience and you know they understand Hindi, mixing a few Hindi words and sharing a joke in Hindi is a good idea. Nothing connects more than vernacular. Why does this Keynote Speech Template work? Stories are not boring. They get people to pay attention. Stories are easy to understand and remember. Analogies too help your audience understand and remember. How to implement this Keynote Speech Template? Decide on 3-4 main messages. Any more and you'll overload your audience. Why are those your main messages? What incident, anecdote or story led you to come to that realisation? Share that story first. Share it with passion. Share concrete details. Describe the person, the place and what happened. Then share your message. The takeaway from that story. Following this different keynote speech template will help you stand out and connect with your audience. Your audience will like what you say, they will understand you and remember you. You cannot afford to talk like everyone else. Try this out and see how it works wonders.